rec. Hofmusikkapelle, Vienna, 20-21 June, 21 November 2011. Despite fierce competition in some quarters, this CD is well placed to win the 'Daftest Cover of the Year' award, although the jester's hat in the top right-hand corner suggests a deliberate tongue in cheek from label and ensemble alike. 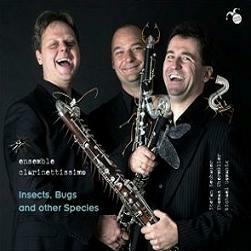 'Insects, Bugs and Other Species' takes its name from the opening piece by Dora Cojocaru, yet contrary to expectations set up by the cover, insects play no further part in Ensemble Clarinettissimo's programme: no transcriptions for clarinet trio here of Rimsky-Korsakov's 'Flight of the Bumble Bee' or Vaughan Williams' Wasps Overture; not even the old Spanish corrido 'La Cucaracha'. Instead, a selection of pieces averaging four minutes, many of which are by composers whose names will be unfamiliar to most. Illumination must be sought elsewhere however, even with regard to what century some of them originate in: the foldout digipak-style CD comes without a booklet. German-English notes, such as they are, are printed straight onto the glossy card. The English version is rendered by a non-native and phraseology and sometimes even translation itself tends towards the clumsy or ungainly, once or twice obscuring meaning: "every cemetery unites the enemies of life". A further possible irritation is the affected heading: 'What Would Music Be Without Its Niches? Boring'. Such a remark makes little sense to someone whose tastes are entirely orthodox or popular - the niches themselves are then boring or even unacknowledged. Exciting music would still be exciting if no niches existed. What is a niche anyway? - the term is undefined here. Of the fifteen composers who have "taken their seat", according to the notes, Mozart and J S Bach cannot by any stretch of the imagination be considered 'niche'. To more concrete matters: Austrian trio Stefan Neubauer, Thomas Obermüller and Michael Domanig, collectively known as Ensemble Clarinettissimo - no relation to Clarinettissimo Austria, five clarinettists and a drummer! - are all virtuosos, as the opening title track makes quite clear. On the whole, however, most items are not particularly demanding, though the Ensemble do still coax an admirable range of sounds and emotions from their instruments. Three clarinets, in expert hands like theirs, have a tonal, technical and dynamic range that few other 'mono-trios' can surpass. Insects, Bugs and Other Species is an unfortunate choice not just for the album title, but for the programme starters, as it is a piece quite different from most of the rest. Free-form, dissonant, perhaps even aleatory, it certainly stands out beside the Hummel the follows. Even Wilhelm Spuller's pretentious Super Mario's World Zwanzigelf, with its added hand-slapping and finger-clicking, is basically tuneful and pulse-driven. Until the final track, only Wysocki's Etude comes fairly close to Cojocaru in spirit. Wladimir Pantchev's recital-wrapping Wettspiel is an extraordinary workout for all three players, yet despite its brilliance, it re-poses the question initially raised by the Cojocaru - who is this album really for? The label, Paladino trading as Orlando, misguidedly files it under 'Crossover'. It is not that at all - there is nothing half-baked about the musicianship on display, whether performer, composer or arranger. Clarinettissimo's programme actually has plenty of variety, both across the centuries and styles and in emotional terms. Even some Alpine yodellers! Yet there is not enough here for art music aficionados, whilst on the other hand the first and last tracks, one fifth of the total running time, are very unlikely to speak to those wanting something a bit more 'easy listening'.